Black 2006 Crossfire 700. Suspension rebuilt approx. 250 miles ago by Fett Brothers Performance. The Diamond Drive was apart and inspected and oil changed also. Rear suspension is set up like a 2006 M-series. 2" challenger track, Speedwerx 10.4" secondary conversion(runs an M8 style belt now), Speedwerx single pipe and can, Speedwerx primary spring &weights for sea level to 5000' elev. 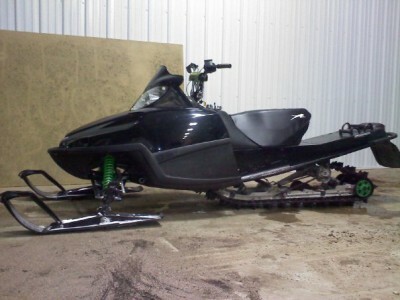 Black C&APro skiis, 3" handlebar riser,Arctic Cat interior tunnel stiffeners, WPS exterior tunnel stiffeners. Stock parts that are still available come with it, as well as most of the 5 gallons of Torco oil I have been using in it.